Georgetown City Hall is located at 120 North Fraser Street, Georgetown, SC 29440; phone: 843-545-4001. Photo: Hopsewee (Thomas Lynch, Jr. Birthplace), ca. 1735, 494 Hopsewee Road, Georgetown, SC. Listed on the National Register of Historic Places in 1971. Photographed by User:Jerrye & Roy Klotz MD (own work), 1971, [cc-by-3.0 (creativecommons.org/licenses/by/3.0)], via Wikimedia Commons, accessed December, 2013. Georgetown has evidence of Spanish settlement as early as the 1520s but was not laid out as a city until 1729. In 1735 Georgetown was conveyed to three trustees. A plan of the city was attached to the deed and was the first plan to be preserved. Included in the plan were 174-1/2 acres for the town and 100 acres for a commons. The town acreage was divided into blocks by five streets running at right angles to the river. Much physical evidence of the past remains. 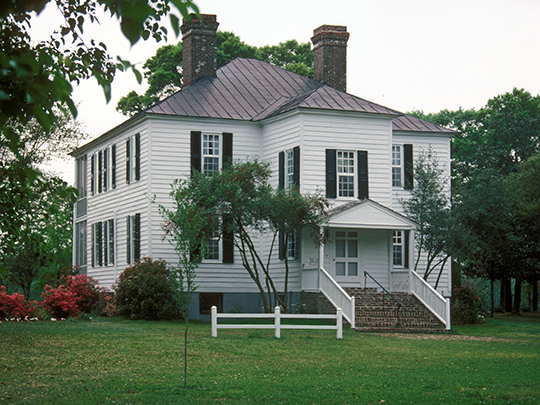 The oldest existing structure in Georgetown is a dwelling which dates from ca. 1737. Third oldest city in South Carolina, Georgetown is significant historically, militarily, agriculturally and architecturally. During the American Revolution, Georgetown was captured by the British, July 1, 1780, and recaptured by General Francis Marion in May 1781. Between November 1781 and December 1782, the city became the vital port of entry for supplies from Philadelphia performing an invaluable service for Greene in the last phase of his campaign. During the Confederate War, the Union blockade of Georgetown was effective due to close proximity of the coaling, refitting and supply station at Union-held Port Royal. The Federal fleet in Winyah Bay lured many slaves away but showed restraint in burning only buildings used for military purposes. On February 25, 1865, Union naval forces occupied Georgetown and converted the Winyah Indigo Society Building into a Union hospital. Agriculturally, Georgetown was representative of a community based almost entirely on the production of two staple crops, indigo and rice. Rice, however, was the dominating crop, and it is likely that no other area in the United States has been as dependent for so long a period of time on this crop. At the peak of its rice culture (ca. 1850), Georgetown was the largest exporter of rice in the world. Education, travel and long visits to their Charleston mansions set the rice planters' families apart from the rest of the people of the district. The planters' children were educated at home by tutors and often went abroad or to northern schools for university work. Nancy R. Ruhf, Historic Resources Coordinator, South Carolina Department of Archives and History, City of Georgetown Historic District, Georgetown County, SC, nomination document, 1971, National Park Service, National Register of Historic Places, Washington, D.C.